German teacher and writer; born at Frankfort-on-the-Main in 1849, in the same house in which Ludwig Börne was born, and which was the property of her father, who was one of the minor officers of the Jewish community of Frankfort. She was graduated from the Wiesbaden Women's College in 1867, and for fifteen years was teacher in the school of the Frankfort Orphan Asylum. 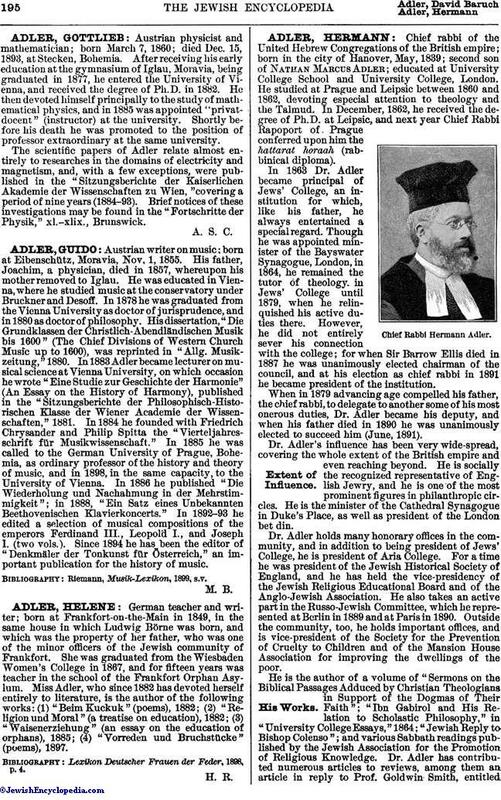 Miss Adler, who since 1882 has devoted herself entirely to literature, is the author of the following works: (1) "Beim Kuckuk" (poems), 1882; (2) "Religion und Moral" (a treatise on education), 1882; (3) "Waisenerziehung" (an essay on the education of orphans), 1885; (4) "Vorreden und Bruchstücke" (poems), 1897. Lexikon Deutscher Frauen der Feder, 1898, p. 4.